I’ve long lamented the lack of virtual desktops (or virtual workspaces) on Chrome OS. After all, this concept is a reality on Mac OS, Linux and Windows. Sure, Microsoft just added the feature a couple years ago, but users had been clamoring for it for years up to that point. Imagine having three monitors side by side. Using those extra screens usually means having something like one screen with messaging, one screen with a browser and maybe another with creative apps like Photoshop, and IDE, or a video editor. Everyone’s setup is different, but you get the gist. Without having to move windows around, I can simply move my eyes back and forth and see all my workspaces simply. When you move that type of setup to a single screen, all those open window get stacked on top of one another and workflows are simply not as good. You have to either minimize/maximize windows or over-utilize the overview mode to see what you are doing. To me it starts to feel claustrophobic pretty quickly. Given the option to work with multiple monitors, I’ll take that setup every single time. This is where virtual desktops help. In much the same way as multiple monitors work, I can set up workspaces in the same virtual space I’d use individual monitors. Then, with a simple gesture, I can see what is on my virtual screen to the left or right. Once you get used to moving the screens around instead of moving your eyes or head, it feels quite natural in use and allows a different level of productivity once you have it down pat. I tend to work at my desk with an extended display most days, but there are times where I’m stuck with just my Chromebook. In those cases, extended monitors would VASTLY improve my workflow. 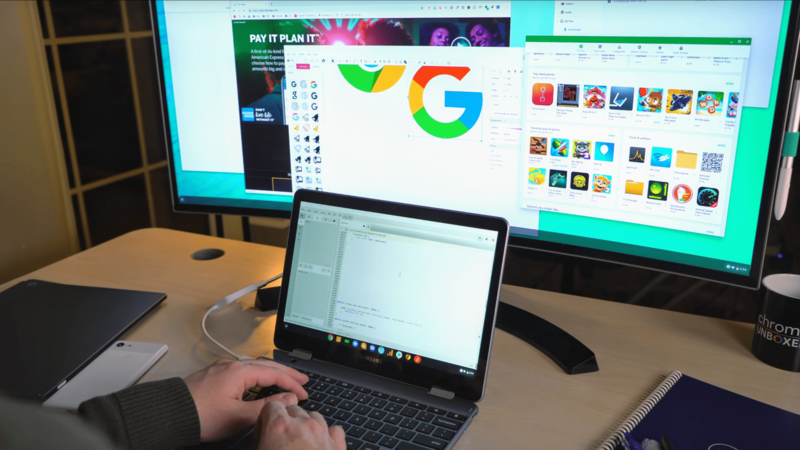 David Ruddock over at Android Police recently spoke with Kan Liu, Senior Product Manager for Chrome OS, and Kan revealed that this much-requested feature is coming to Chrome OS and is officially on the road map. Now, before you get too excited, Kan was not clear about how far down that road we’re talking, here. My guess is this is many months out at this point, but I’ll take that over the virtual silence we’ve had in the past. Honestly, there’s a long-running bug report that has requested this feature and it is the only bit of light I’ve held onto in hopes of seeing this feature hit Chrome OS. Bug reports can sit for years without any official word from Google (the one I just referenced I can, so to hear this actually get acknowledged by Kan Liu makes me very hopeful it will make it to Chrome OS sooner rather than later. What about you? Do you use virtual desktops on another OS? Have you in the past? Would you consider using it in the future? We’d love to know and I’m sure the Chrome OS developers would like to as well.